Brunch is the best meal of the week, if you ask me. Serve it up for friends and family on a weekend morning with an assortment of goodies (both savory and sweet) to choose from, and you’ll become everyone’s best friend. Well, maybe not everyone, but you get the picture. Make ’em some great food! No brunch would be complete without muffins, and these sweet little blueberry almond muffins are perfect. With just a bit of maple syrup, they won’t cause a sugar crash! Almond butter keeps these beauties rich and flavorful, and an excellent source of protein. 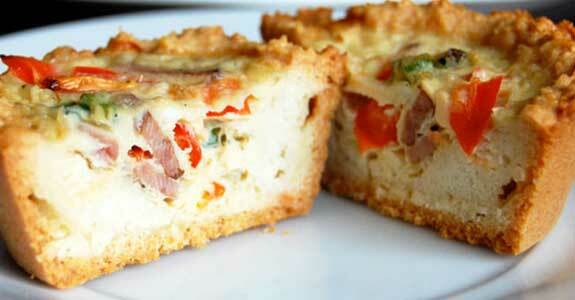 Everyone gets their own personal sized quiche for brunch. A much better way to serve up quiche because you don’t have to worry if it will fall apart when trying to slice it and serve it. Just the right crust to quiche ratio too. Why not serve a delicious and nutrient-dense smoothie at your next brunch? This one is perfect with its sunny orange color, coconut-orange-carrot flavor, and vegetable nutrients with immune-supporting properties. This “yogurt” isn’t probiotic, but it’s a simple and easy replacement to dairy yogurt you can add to your table to go with fruit, granola, nuts, or other add-ins. Dates give this creamy delight a mild sweetness, while vanilla and cinnamon are the best of flavor pairings. Some people might say a brunch wouldn’t be complete without donuts. I’d say that’s pretty close to the truth. So let’s talk about these triple chocolate donuts made with a ripe plantain! These are moist and delicious—multiply if you’re feeding more than a few! These cinnamon rolls belong at your brunch table. They’re soft and sweet—the perfect taste and texture of a cinnamon roll that lives up to its name, without being overly sugary. 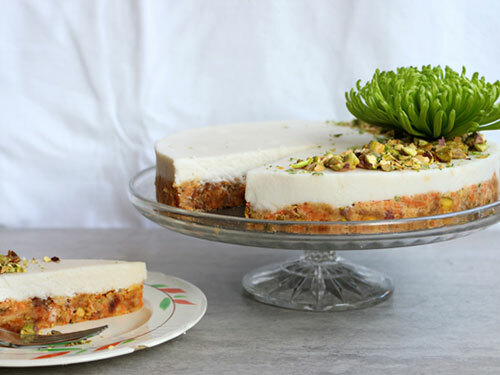 They happen to be nut-free, and iced with a lightly sweet coconut drizzle. This simple-to-make omelette is not at all simple in flavor. The bright lime balances cool avocado—but not for long, with those chili peppers and, if you choose, a dash of Frank’s Red Hot Sauce! This might be my favorite recipe so far, since I’m a donut fan (healthy-style and in moderation) and maple is queen in my house. These are sweetened with mashed banana and a one-ingredient maple butter topping. 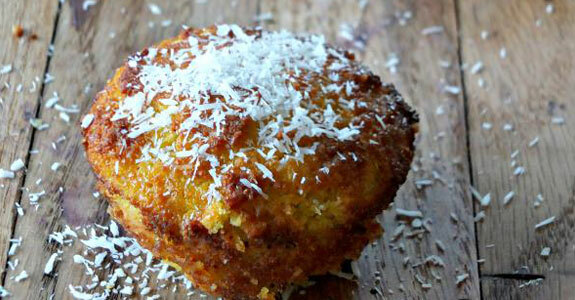 They’re fried in coconut oil or lard, and oh so good. There’s a certain finesse involved with this particular egg-cooking technique, to avoid burning yourself while creating those beautiful golden and delicious crispy edges to your fried eggs. But they’re so worth it, especially seasoned with a bit of pepper and oregano. In my book, anything mango is already marvelous. But these muffins really do take the cake. Made with a blend of starches as well as coconut and almond flours, they have the perfect texture and a sweetness that comes entirely from fruit. That’s right—no added sweetener in these! This is the recipe for those times when you’re craving a cinnamon roll, but you don’t have the time or patience for the involved process of creating a batch. This flatbread is a great brunch dish and whips up easily with a few different starches, egg, cinnamon, palm sugar, and butter. This is the kind of dish you serve when you need something that’s quick and easy but looks impressive to your brunch guests. The flavors are light and fresh, and these ingredients will fill you up without weighing you down, like all good brunches should. This is my absolute favorite way to serve (and eat!) eggs. 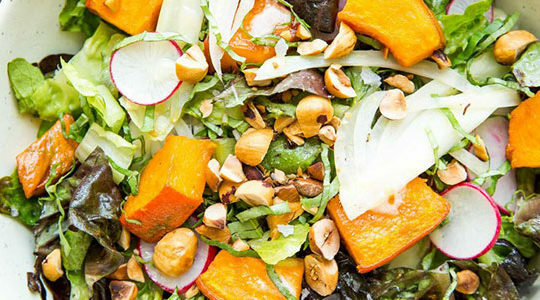 Full of healthy fats, it’s a dish that will keep you full and fueled. It also tastes amazing and is incredibly easy—just crack your eggs into avocado halves (pit removed), sprinkle your favorite seasonings on top, and bake to perfection. This recipe is so simple, it almost doesn’t need to be called a recipe! 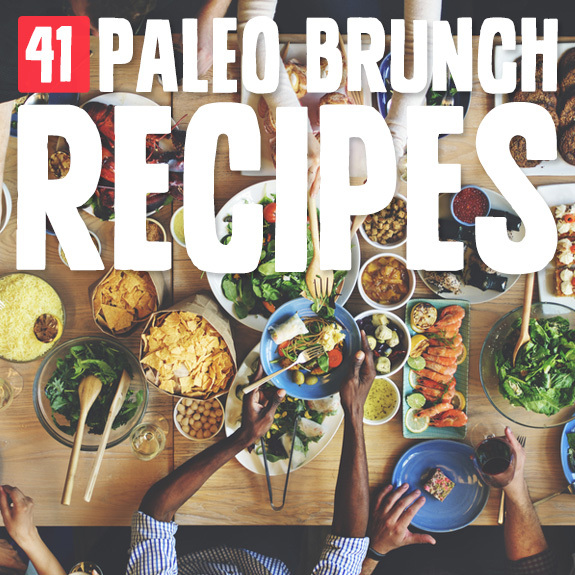 With only three ingredients (shredded chicken, eggs, and your favorite paleo chunky salsa), this dish puts you just a few minutes away from the perfect brunch side dish or main portion of the meal. This smoothie is a nutrient powerhouse with spinach, coconut milk, chia seeds, and optional protein powder. It’d be the perfect smoothie to serve at brunch, even to non-paleo friends or green smoothie skeptics. It’s sweet, smooth, icy, and fresh. If you’re looking for a simple mix of colorful ingredients you can enjoy in any portion, this is your recipe. 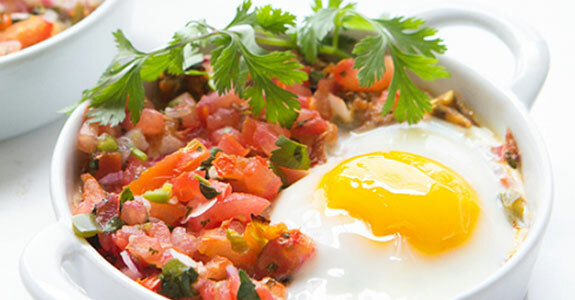 This dish combines eggs, tomatoes, avocado, arugula, and cilantro for a green, red, and yellow breakfast or brunch of champions. The shaved asparagus in this dish easily takes the place of bread in a more traditional brunch. But why not squeeze a vegetable into your morning meal if you can get away with it? And you can, because this savory egg with chilies and pine nuts is amazing. 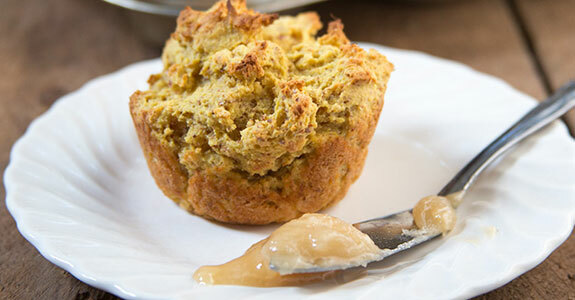 Here’s another muffin recipe that’s sure to be popular. These grain-free treats are sweetened with maple syrup and are full of finely diced (or crushed) pineapple, coconut flakes, macadamia nuts, and coconut cream. If you make this for brunch at your house this weekend, invite me over. Seriously. I’ll bring the smoothies to go with it. 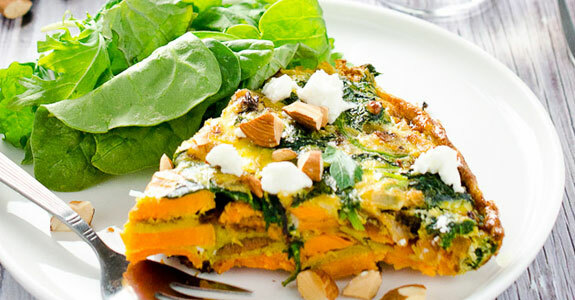 This savory and protein-rich dish would make just as fantastic a dinner or lunch as it would a brunch component! This is going on my must-make list. Would you believe me if I said these donuts have only four ingredients? Well, they do! 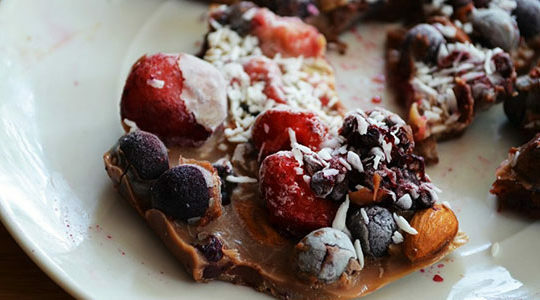 And they’re the perfect grain-free baked donut. You need nothing more than almond flour, honey (or maple syrup, etc. ), eggs, and vanilla extract. Easy and delicious. This is the perfect replacement for that breakfast sandwich you once loved, but have given up in favor of a healthier, lower carb alternative. This is no sandwich—it’s a stack. A stack of fabulous eggs, sausage, spinach, and the finishing touch—crispy fried sage. Frittatas are an excellent addition to brunch, because everyone loves eggs, and frittatas can be a great small component of the meal as well as a main dish, depending on the portion size. 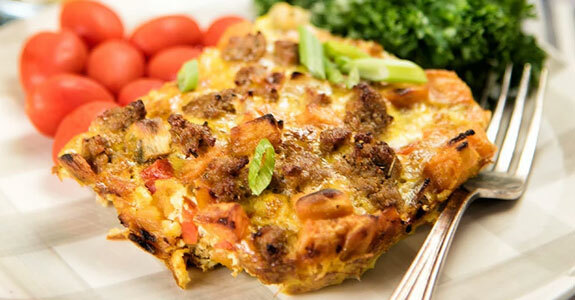 They can be made dozens of ways, and this curry frittata is one of my favorites. This bread has no wheat in it (duh) but it makes a great substitute in flavor, texture, and looks. If you’re like me, you can’t imagine going 100% without bread, even if you’re fine not having it every day. This is the perfect recipe for bread-lovers. This copycat sandwich will have you in heaven in half an hour. That’s right, a paleo bagel sandwich! I’d definitely include the bacon in this one for that extra smoky-sweet flavor. Just make sure your mayo is paleo-friendly (homemade is usually your best bet). Okay, maybe this one’s my favorite! I’ve always loved hash browns, and I’m a huge plantain fan—that’s the main ingredient (practically the only ingredient) in this brunch dish, which is potato-free and still satisfies that starchy craving, but in a more nutritious way. These muffins have a lovely vanilla flavor and can be topped with whatever berries or fruit you like best. Feeling a cherry amaretto muffin? Use cherries and add a quarter teaspoon of almond extract. The possibilities are endless! Adding avocado to your smoothies is a great way to make them more filling and to add healthy fats. This banana-orange smoothie with avocado would be the perfect thing to serve to guests for brunch this weekend—they’ll be so impressed at how creamy it is without any dairy! If you’re not into the paleo bread for any reason, feel free to serve this with sautéed greens. It’s simple and easy, and tastes amazing. The hollandaise sauce is a fantastic source of healthy fats and vitamins, while the cucumber salsa is cooling and refreshing. 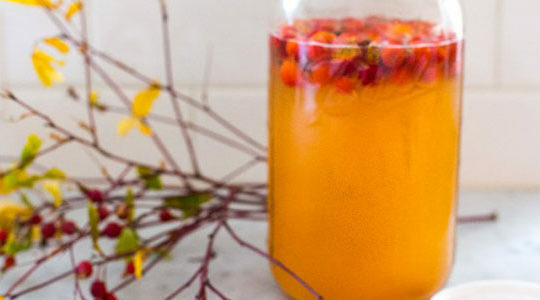 Mix this baby up and cut all your friends and family a slice of it, to be topped immediately with a fruit compote of your choice (you can totally use the cherry one suggested, or anything else you like). Easiest pancake ever? You bet. This casserole is packed with sausage, sweet potatoes, onion, bell pepper, garlic, coconut milk, and peppery flavors. Full of healthy proteins and fats, it’s a great addition to your brunch table as a main dish or side dish. And it’s pretty, too! These muffins are enjoyed by all—they’re grain-free, maple syrup-sweetened, and packed with both chocolate and vegetables. What’s not to love? Nothing—that’s what. 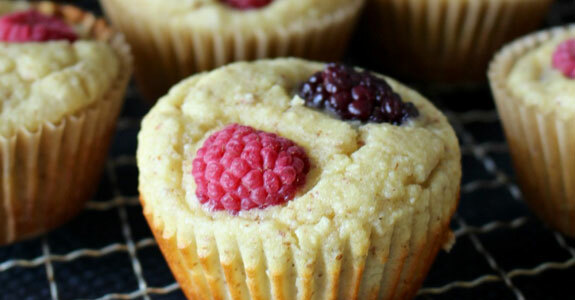 Everything about these healthy (in moderation) muffins is pure love. 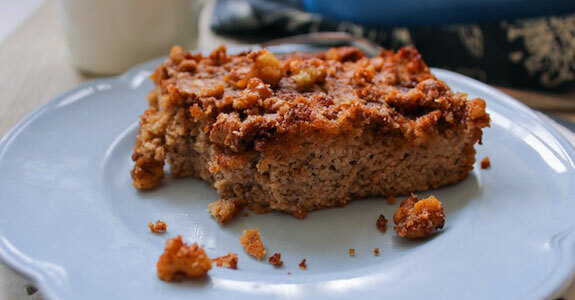 This buckle is like a cross between a fruit crisp and a coffee cake. That’s right. It’s a coffee cake with the fruit baked right into the bottom. This one uses cherries, which are an excellent brunch fruit, if you ask me. They’re high in both antioxidants and flavor. If you’d like to make up a batch of waffles for brunch this weekend, give these pumpkin waffles a try. They’re moist and flavorful, and are made with almond butter and sweetened with a banana. The vanilla pumpkin pie flavor of these is sure to get your taste buds going. 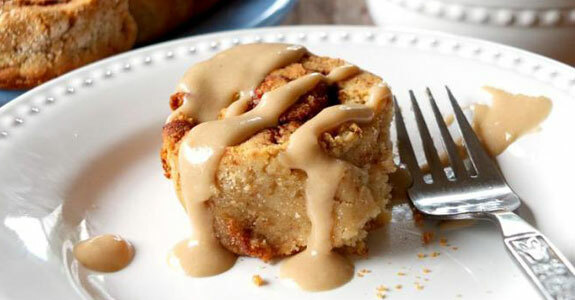 This coffee cake is a challenger to those boxed ones you used to buy in your pre-paleo days. You know the ones—pure white flour, white sugar, and a handful of ingredients you couldn’t pronounce. But why, when this one is so much tastier and better fuel for your body? These skillets are packed with pepperoni pizza flavor, and are sure to be the envy of your brunch guests with their impressive looks and tastes. 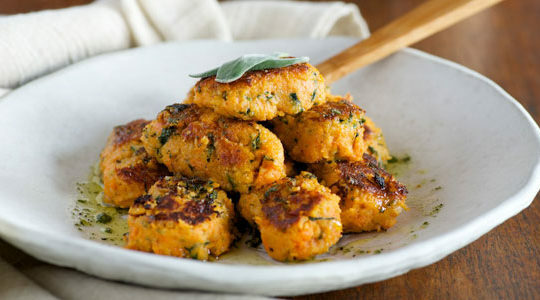 I love the marinara sauce here as well as the basil and oregano, but these are much healthier than any slice of pizza. These are great for brunch, because they don’t require as much commitment as a full plate of French toast. Serving a bunch of other things, too? Your friends and family can just take a few of these with pure maple syrup and enjoy along with your eggs and bacon. 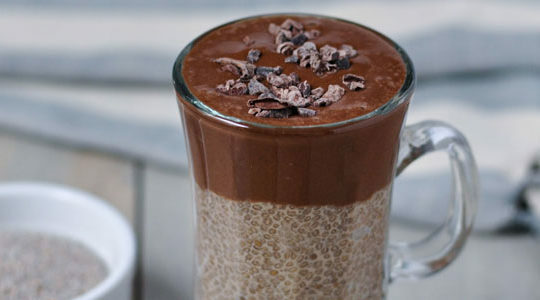 Small servings of chia seed pudding will wow your brunch guests with their flavor, texture, and fabulous presentation. This recipe, with pineapple and vanilla protein powder, is especially power-packed and is unbelievably easy. 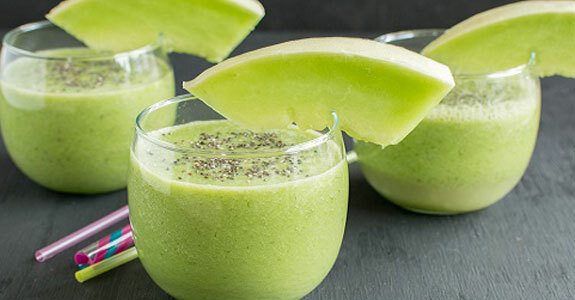 This beautiful smoothie hides its greens in a different way—its base is already green! Banana keeps this smoothie sweet, and chia seeds add a bit of extra body as well as protein, omega-3s, and hydrating properties to keep you healthy. I’ve already shown you avocado egg cups, but have you seen these eggs baked in the folds of half an artichoke? They’re fantastic and a unique spin on regular old eggs. I’m closing out with these beautiful and delicious cobblers. They’re perfect for your next brunch because they can be made in single-serving dishes, and they’re light and a little bit sweet with a modest amount of maple syrup or honey. This eggs Benedict features a grain-free biscuit made from almond meal and coconut flour sweetened with a touch of honey. Yum! On top of that, you’ll pile perfectly cooked eggs, lightly cooked asparagus, and a fresh, tangy avocado hollandaise sauce with only three ingredients.